Dynamic EMS Ltd welcomes our first Modern Apprentice to the company. Process Improvement Manager, Gordon Macdonald, welcomes new modern apprentice, Lewis Adie, to the team at electronic manufacturing services provider Dynamic EMS Ltd.
A Modern Apprenticeship combines a qualification with on-the-job experience. 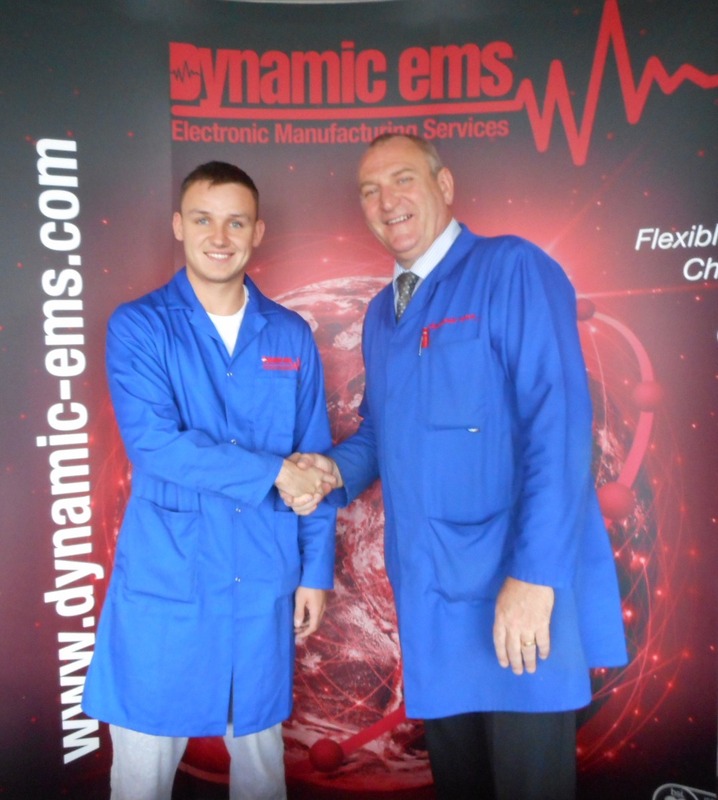 Dynamic EMS Ltd welcomes our first Modern Apprentice to the company. Lewis Adie joined Dynamic on 5th September 2016 to undertake an Apprenticeship in Engineering. The Modern Apprenticeship is delivered in partnership with Fife Council and Skills Development Scotland. Lewis will be able to combine on the job experience and gain an industry recognised qualification. John Dignan, Managing Director at Dynamic EMS Ltd commented, “Moving forward we hope to be able to offer further apprenticeships, as we realise the importance of developing skills and giving individuals every opportunity possible in securing a bright future”. Dynamic EMS Ltd is a provider of low-medium volume electronics manufacturing services. ATEX approved and operating across global and diversified markets delivering integrated manufacturing solutions tailored to meet our customer’s commercial and technical requirements. Quality, Flexibility and Reliability together with a focused customer service culture ensures customer satisfaction.